collective:unconscious is available to watch and download for free online. A 41-song ‘dream mixtape’ compiled by the filmmakers. Deleted scenes, mood boards, and peaks inside the filmmakers’ processes. The Nyquil Version - a remix of the entire film meant to fall asleep to. And for those of you who don’t understand what a BitTorrent is, we’ve uploaded the film to Vimeo and YouTube too. Download is enabled on Vimeo, so feel free to grab the MP4 and watch it on your smart TV at your leisure. Thank you for watching. We are giving this film away because we want as many people as possible to see it. We’ve put our hearts, souls, and subconsciouses into it, and we hope you like it! 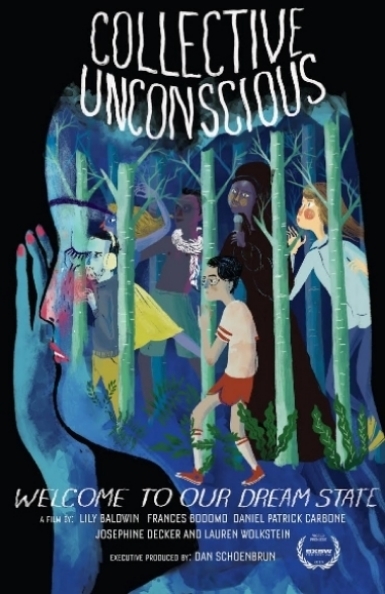 Welcome to collective:unconscious, a new collaborative feature in which five of independent film's most adventurous and acclaimed filmmakers join forces to adapt each other's dreams for the screen. Featuring new work by Lily Baldwin (Sleepover LA), Frances Bodomo (Afronauts), Daniel Patrick Carbone (Hide Your Smiling Faces), Josephine Decker (Thou Wast Mild and Lovely), and Lauren Wolkstein (The Strange Ones), collective:unconscious pushes at the boundaries of narrative and surrealism, inviting viewers to immerse themselves inside a literal dream state. It's "like nothing you've ever seen with your eyes open." (Rolling Stone). Frances Bodomo (Director) is a Ghanaian filmmaker & one of the 25 New Faces of Independent Film. Her first short film, Boneshaker (starring Oscar-nominee Quvenzhané Wallis) premiered at Sundance 2013. Her second short, Afronauts, premiered at the 2014 Sundance, Berlinale, and New Directors/New Films Festivals. Frances is currently developing the feature version of Afronauts (supported by the Sundance Institute, Tribeca Film Institute, IFP, the Alfred P Sloan Foundation, and Spike Lee). Daniel Patrick Carbone's (Director) film debut Hide Your Smiling Faces had its world and north-American premieres at the Berlin International Film Festival and the Tribeca Film Festival in 2013 and was awarded the Best Undistributed Film of the Year by the National Society of Film Critics. Hide Your Smiling Faces was released theatrically and on cable/VOD in Spring 2014 via Tribeca Film. Daniel resides in Brooklyn, NY where he co-owns the collaborative filmmaking group and production company Flies Collective. Josephine Decker (Director) was recently called “the most original independent filmmaker to surface in the past few years” by The New Yorker, who also said that she is ushering in “a new grammar of narrative.” She aims to spark curiosity and wonder in audiences through lively, spiritually rich character-driven films. Josephine’s narrative features Butter on the Latch and Thou Wast Mild and Lovely premiered at the Berlinale Forum 2014. Her films have screened at MoMA, SXSW, and Silverdocs, and aired on PBS, Logo and Netflix. Lauren Wolkstein (Director) is an award-winning filmmaker and assistant professor of film at Temple University. Her short film work includes Cigarette Candy (SXSW 2010 Best Narrative Short, Palm Springs ShortFest 2009 Best Short), The Strange Ones (Sundance 2011 World Premiere), and Social Butterfly (Sundance 2013 World Premiere). Lauren was recently named one of Filmmaker Magazine’s 25 New Faces of Independent Film, and is currently developing her feature film debut. Dan Schoenbrun (Executive Producer) is the ringleader of collective:unconscious, and the co-founder and co-creator of The Eyeslicer. Previously, Dan served as the Senior Film Outreach Lead at Kickstarter, the Associate Director of Programming at IFP, and the Associate Editor of FILMMAKER Magazine. Dan has spoken about filmmaking at dozens of film festivals around the world, including Cannes, the Berlinale, Sundance, SXSW, Hot Docs, NYFF, and TIFF. His own short film work has screened at places like BAMcinemaFest, the Maryland Film Festival, and Cucalorus. Envelops you in five different dream worlds, each with distinct style and bracing originality. For all inquiries, please contact Dan Schoenbrun (schoenbd at gmail dot com). For press notes and high quality stills, click here.